Nightsister Initiate is a single target critical based damage dealer. Let’s look at this brief guide and see what she has to offer for your team. Basic Ability: Slice Open – Deal Physical damage to target enemy. On a Critical Hit, inflict Damage Over Time for 2 turns. The Nightsister Initiate is surprisingly tanky and deals good damage, especially when paired with Darth Sidious/IG-88 as leader. The more critical rate she gets, the more damage she does. She is a nightsister, so you can put a nightsister leader for bonuses. The fact that she is tanky and can deal damage makes her a very viable character for you if you choose to level her. Her single target damage hits very hard when it is a critical hit. I think most people won’t want to level her because she isn’t a “hero” character. Her buff immunity and damage over time is great against strong/tanky characters. The only downside is that she has no AoE damage. Other than that, she is a solid choice to build as a damage dealer on the dark side. 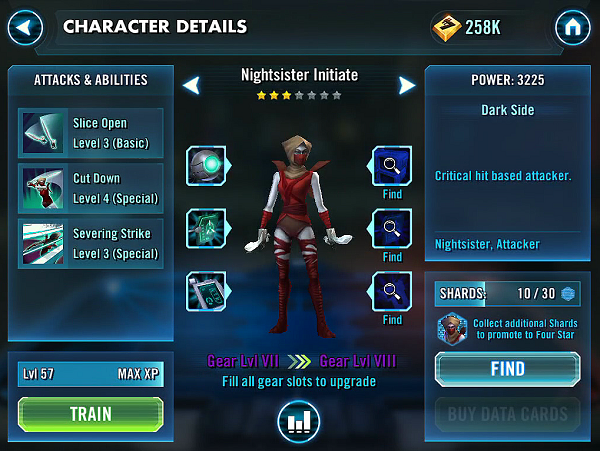 Verdict: Max her if you want a nightsister team or a dark side damage dealer.